Iron casting is utilized to create automotive parts, cookware, construction components, and many other industrial and manufacturing products. Iron Castings – Imperial Casting Company, Inc. The two elements carbon and silicon are two of the primary and most important elements used in creating cast iron alloys. Carbon typically comprises between two and four percent of the weight of cast iron, while silicon makes up one to three percent of the weight. Adding silicon into the mix causes carbon to form graphite which gives cast iron some of its most defining features. The material has a lower density, becomes softer, and shrinks less during the molding process. Additionally, cast iron also exhibits great machinability, wear resistance, fluidity and thermal conductivity. However, the presence of graphite also makes the iron more brittle and susceptible to impacts and fractures. Iron Castings – OSCO Industries, Inc. Cast iron is a very broad category of materials and includes many different iron alloys, and the use of different alloying elements can alter the physical properties of the iron material. 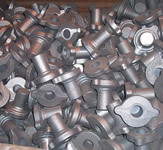 Some other cast iron alloys include grey cast iron, ductile cast iron, and white cast iron. These iron alloys differ based on the quantity and structure of the graphite within the material. For example, the graphite within grey cast iron forms sharp flake shapes while ductile cast iron contains a spherical or nodular graphite structure. Grey cast iron exhibits the typical brittle properties of cast iron, but the unique structure of ductile cast iron greatly improves the durability of the material. Overall, the particular properties of each kind of cast iron make them some of the most commonly utilized metals in industry. Iron Castings Iron casting is the process of creating different shapes, parts, and products from liquefied iron or iron alloys. The molten iron is poured into a mold where it is allowed to cool and solidify into the desired shape.